We spend the vast majority of our lives working. If you’re unhappy at work or worried you could get laid off, isn’t it time you stop worrying and take action? You’ve come to the right place! The following How To Engineer Your Layoff review will teach you about the perfect book to help you take your future into your own hands. What is How To Engineer Your Layoff about? Are you sick and tired of your job and dying to get out? Do you dread getting out of bed in the morning because you don’t want to go to work anymore? Is your company downsizing? Are you worried you could get laid off? This inspiring ebook will teach you How to Engineer Your Layoff with a nice severance package to help you along your way. Sam Dogen has successfully helped many people engineer their layoffs to lead more meaningful lives. Now it’s your chance to learn step by step how to engineer your layoff so you will have the knowledge, confidence and prowess to succeed. 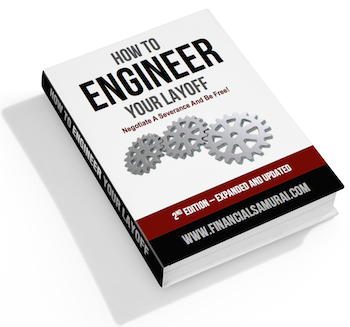 Newly updated in it’s second edition, How To Engineer Your Layoff is designed to help you leave your job with money in your pocket. Since publishing the first edition in 2012, many readers have successfully engineered their layoffs to work in a new field, spend more time with their family and travel. The book personally enabled me to get paid to leave my job that had me stressed to wits end for years. My experience reading and applying How To Engineer Your Layoff to my career completely changed my life. Now I get to do work that I love every single day completely stress-free. You too have a chance to become a success story! 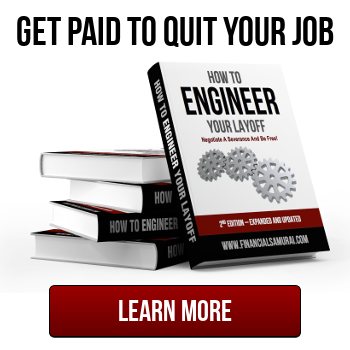 Who should read How To Engineer Your Layoff? Curious if this book is for you? Here’s just a small sampling of reasons why you should read How To Engineer Your Layoff. You are unhappy at work and want to quit your job. You are interviewing for a new job or already have one lined up. Your department and/or employer is showing signs of trouble. Your company is likely to or actively going through layoffs / reduction in force (RIF). You’re bored at doing the same thing for years and want to do something new. You want to retire early. You want to spend more time with family. You want to care for a loved one who is sick. 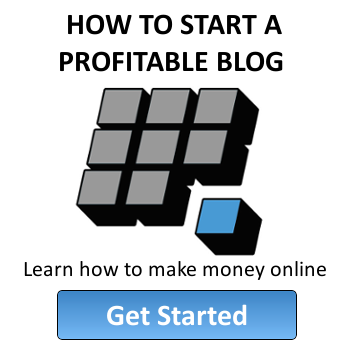 You want to start your own business. You want to switch industries. You want to go back to school. You work in HR and are involved in staffing. You are a manager or supervisor. Sam started the popular personal finance blog Financial Samurai in 2009 during the depths of the financial crisis as a way to make sense of all the chaos that was happening around us. After 13 years of working in finance, he decided to retire in 2012 and utilize everything he learned in the business to help people achieve financial freedom sooner, rather than later. Instead of just calling it quits and handing in a resignation, Sam ingeniously negotiated a severance package. He received a generous lump sum severance that provided him with over six years of living expenses! His total severance package was valued at over $550,000. Now that’s impressive! Sam’s experience gave him the opportunity to fully pursue his love of writing on Financial Samurai and helping people around the world improve their finances. His voice is one of the most brilliant, unique, and witty styles around. I’ve been reading his work since 2009 and am amazed at how he continues to produce creative, in-depth and insightful content and advice multiple times a week. 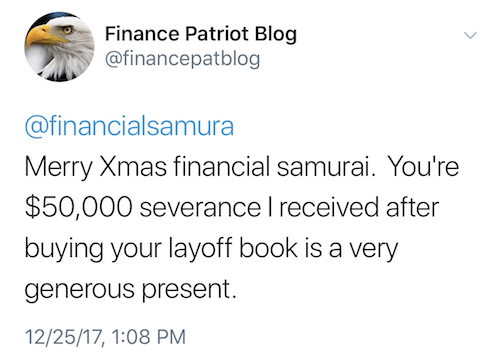 I definitely recommend reading Financial Samurai on a regular basis in addition to the ebook How To Engineer Your Layoff. What’s included in the ebook? Here are just a few testimonials in addition to my own How To Engineer Your Layoff Review. “How To Engineer Your Layoff”, allowed me a blueprint for putting the title theory into practice. With six months of living expenses I would not have received had I resigned, the results speak for themselves. Examples of relationships I would need to cultivate, persuasive arguments I would need to make, and real practical advice are all included and have paid for the book a thousand times over. Thank you for the book.” – JayCeezy (read his full review here: Yes, I Got Laid Off! Thank Goodness For Severance Packages! And check this one out too! Ready to download your own copy of How To Engineer Your Layoff? Access the store page here to learn more and purchase the ebook. You can download it instantly and start reading. I can’t believe how much this book changed my life. Check it out for yourself and take control of your future!